floor. Grandma, in her patchwork apron, was always in the kitchen (even during most of the meal). Football or the Macy's parade was the tv background noise, and the kids sneaked cookies and made the first Christmas lists of the season, using thick catalogs as inspiration. Like every American family, we had our traditional Thanksgiving dishes. Turkey, of course, bread stuffing (to my southern mom's dismay -- cornbread stuffing was the only way to go for her), pumpkin pie from my great-grandmother's recipe, homemade rolls, mashed potatoes with gravy, and among many other things, this apple-yam dish. For whatever reason, our family never really went for the marshmallow-topped sweet potato casserole that many other American families enjoy. And I'm kind of glad. This dish is simple to make, I love the contrast of the apples with the yams (or sweet potatoes - can anyone really tell the difference? 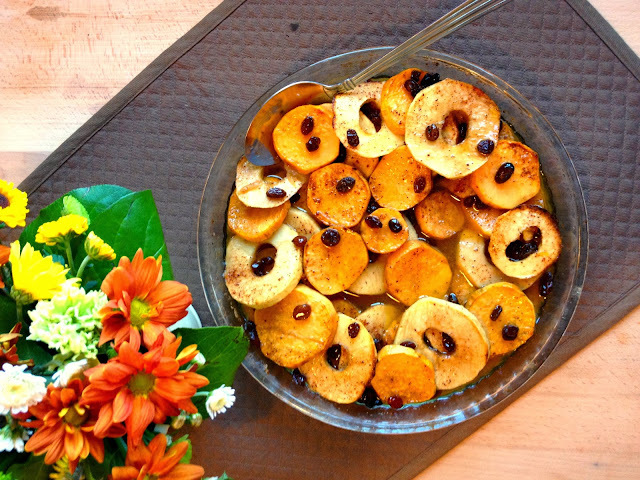 ), and those fall flavors come through, without being drowned in brown sugar and marshmallows. No offense to all the marshmallow-topping folks out there. I understand family traditions. I do. But this dish is a nice alternative, if you're looking for one. Or start your own tradition! Preheat the oven. 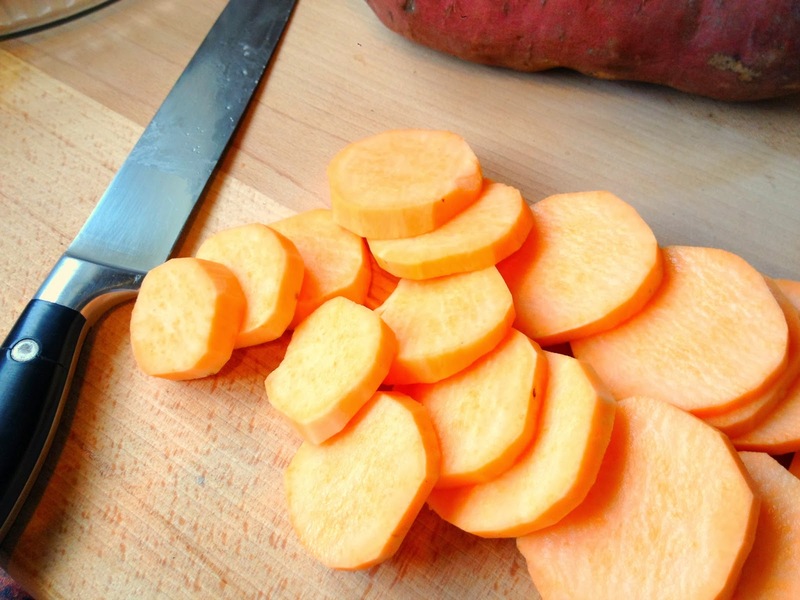 Now take a couple of large-ish yams (or sweet potatoes) and slice in disks. These are actually yams, because I take what I can get here in the wilds of Eastern Europe. The checkout guy at the supermarket asked me what they were and how you eat them. The implied question was why I would buy these weird things when perfectly good normal potatoes are available. But I digress. As I was saying, yams are a little more pale in color than sweet potatoes, and I would venture to say a bit more firm when cooked. But really, not much difference. Use what you like. 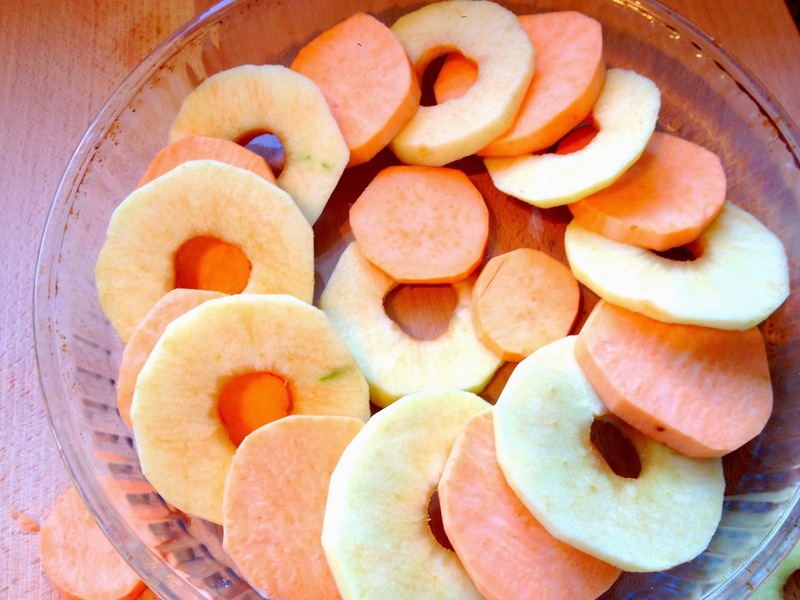 Also peel and core some apples, and slice them in disks, the same thickness as the yams. 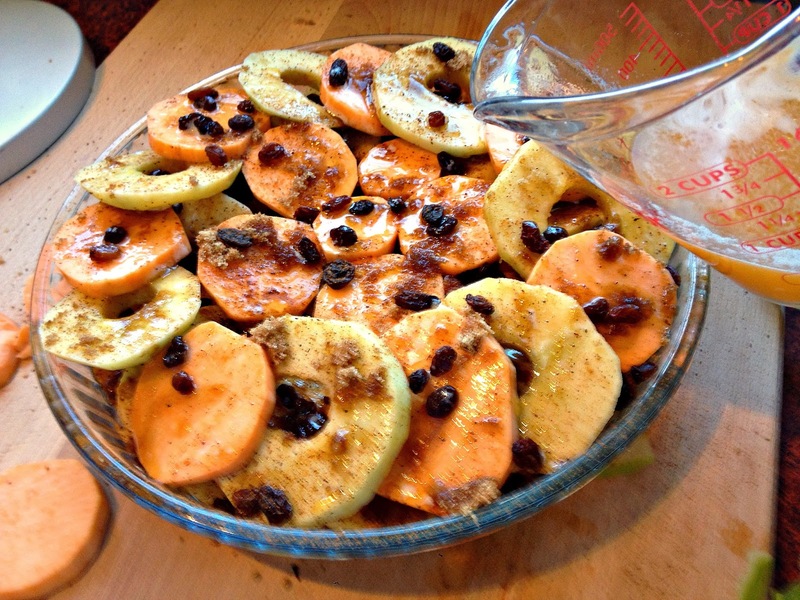 Arrange a layer of apples and yams in the baking dish. A little overlap is ok for pretty-sake. But technically we're going for a single layer here. If you don't have a special dealy-bopper to core the apples, then don't bother, just use thinnish wedges. I just like them all to be circles. Because I do. Now the yumminess --- on top of the layer of apples and yams, we now sprinkle cinnamon, brown sugar, raisins, and a bit of melted butter. Mmmmm. 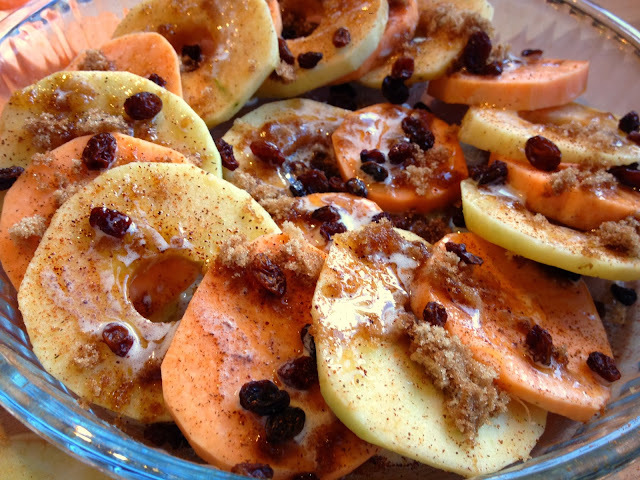 Now repeat all those layers -- another layer of yams and apples, then the yumminess on top. Pour some orange juice over the top, nice and even. Now cover the whole thing tightly with aluminum foil and bake for at least an hour. Every 15 or 20 minutes, I like to peel back the foil and "baste" the yams and apples with the juice from the bottom of the dish. The top layer can get a little dry otherwise. Keeping your foil on tightly also helps things not to dry out. And... voila! 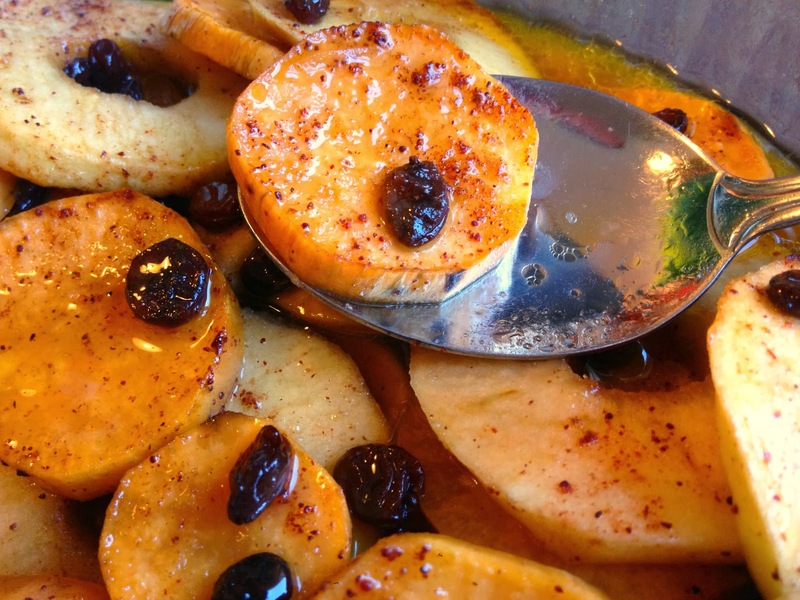 Lovely yams, tangy apples, sweet raisins, and a buttery, orange-y juice keeping it all moist and delicious. A little more sophisticated than marshmallows, and bonus -- you don't have to call in Uncle Brian to mash anything. 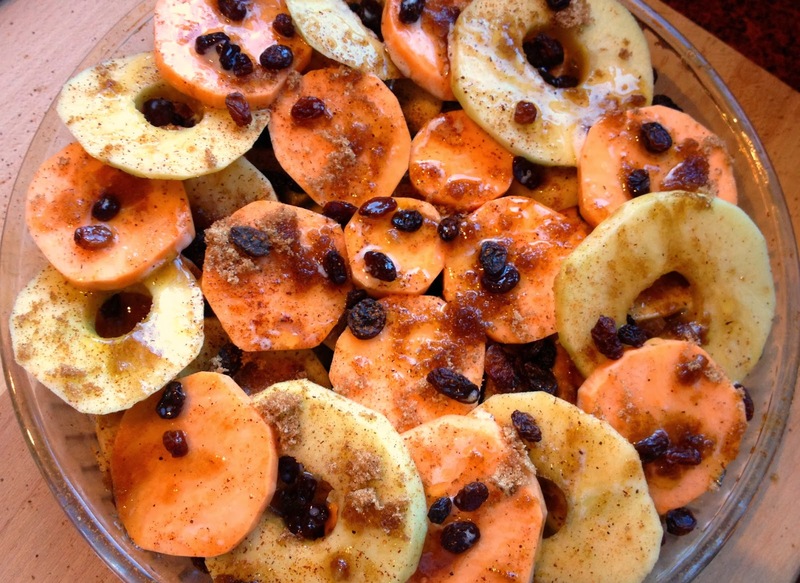 Layer half of the yams and apples in a single layer in the baking dish. 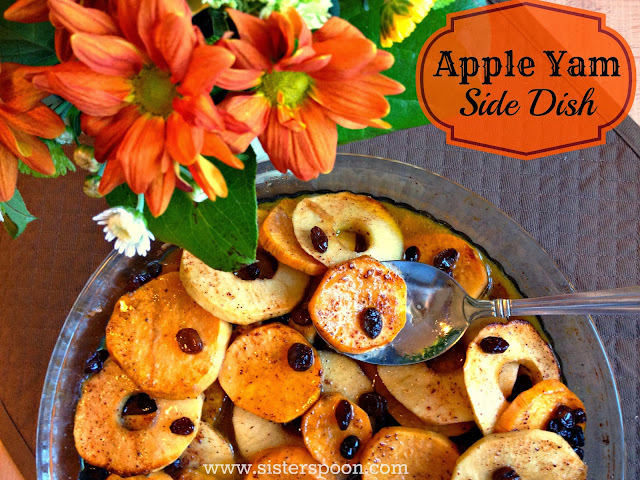 Sprinkle the layer with 2 Tablespoons brown sugar, 2 Tablespoons raisins, 3 Tablespoons melted butter and a sprinkle of cinnamon. Add a second layer of yams and apples, and repeat the sprinkling on top. Pour the orange juice over the top. Cover tightly with foil and bake 60-80 minutes. A few times during baking, peel back the foil and "baste" the apples and yams with juice from the bottom of the pan. Replace the foil and keep baking. 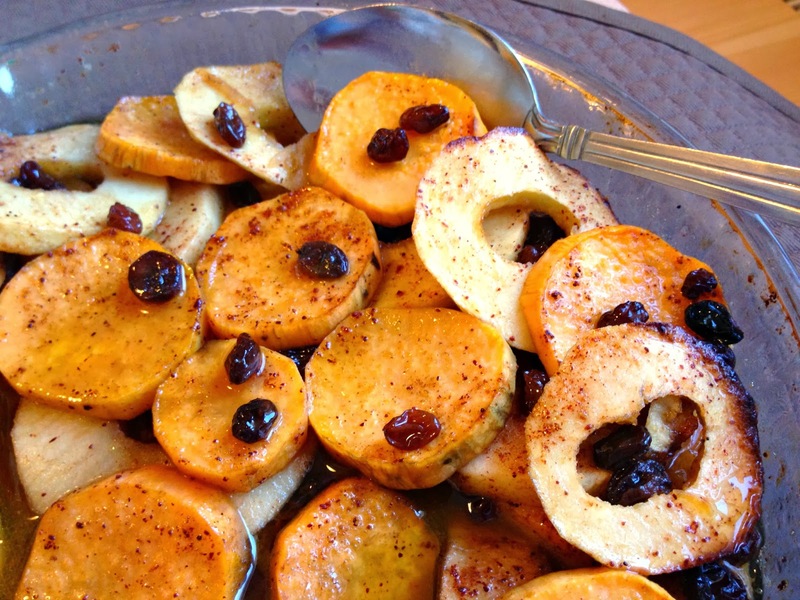 Remove from oven when yams are soft and tender. Serve warm. *You can easily double this dish, just make sure to use a larger baking dish.